DoS, cold call, SQL, and ASCII are on the familiar side of digital and infosec jargon. Most industry phrases and abbreviations are more obscure, so they’re not listed in dictionaries. 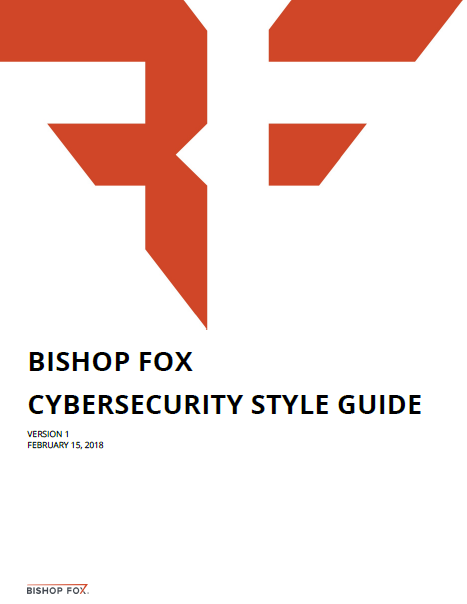 Security consulting company Bishop Fox has done a real service to editors and writers by publishing a modern Cybersecurity Style Guide. The first version, released last month, contains 1,775 entries. I like the Economist and admire its commitment to a clear, plain style of writing. This makes it harder to excuse its perplexing stance on split infinitives. Its style guide says the rule prohibiting them is pointless, but “to see it broken is so annoying to so many people that you should observe it”. There are two things I want to note here. I do enjoy a good style guide: browsing the alphabetical entries, reading the general advice sections, learning how organisations handle sensitive subjects, and seeing how different publishers treat the same material. What usage fiend doesn’t find this stuff fascinating? So I was very happy to learn today that the BBC News style guide is now fully and freely available online. It went public about a year ago but didn’t appear to be accessible outside the UK, except for a PDF which, though generally excellent, dates to March 2003. The online BBC style guide is searchable and easy to navigate. As well as the usual A–Z it has sections on names, numbers, military, and religion. Its page on grammar, spelling and punctuation offers useful tips on capitalisation, homophones, hyphens, US/UK differences, and timeworn bugbears (“By all means, split the infinitive…”), though it also unhelpfully upholds the dubious that/which rule. So, OK, I have a slightly complicated relationship with style guides. As an editor I greatly value how they help ensure a set of texts is styled consistently to a given standard. 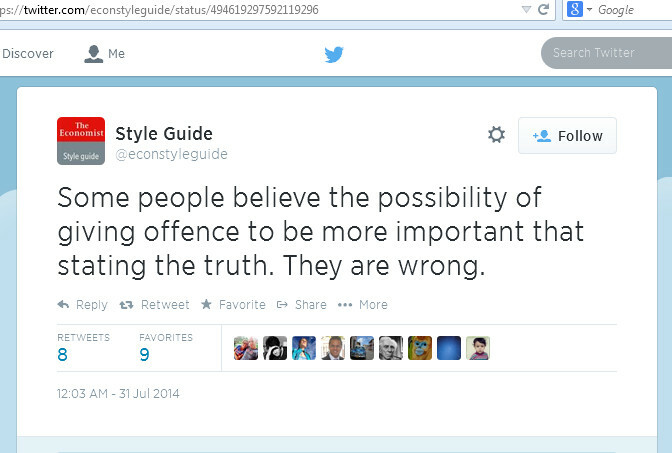 But the descriptivist in me recoils at how conservative, arbitrary and wrong-headed they can be. If I had the time and will, I could spend all day refuting certain style guides on Twitter. But that’s a grouch for another day. It’s browsing time. Tip of the hat to Damien Mulley, whose tweet about the also-newly-freely-available BBC Academy of Journalism alerted me to the BBC’s style guide going public globally. It can also be downloaded as a Word document (44k words in total) at this link. I do not like the repeated use of sic. It seems to impart a pedantic, censorious quality to the writing. I have throughout made every effort to quote the funeral trade publications accurately; the reader who is fastidious about usage will hereafter have to supply his own sics. This “pedantic, censorious quality” is sometimes insinuated and sometimes unmistakeable. Sic – not an abbreviation but a Latin word meaning thus or so – can usefully clarify that a speaker said or wrote just as they are quoted to have done. But it can also serve as a sneer, an unseemly tool to mock a trivial error or an utterance of questionable pedigree. Note, though, that that and which are less interchangeable in AmE than they are in BrE. (The Merriam-Webster Dictionary of English Usage has a helpful history.) Sometimes a distinction is made depending on whether an animal has a name: who for animals with names, that or which for animals without names. This is the AP Stylebook’s advice. That, of course, is permissible when referring to humans: the people that were present or the people who were present. Editors tend, however, to prefer the latter phrasing. the future of continuing-legal-education seminars for the practicing lawyers – the kind whom I teach – looks very bright indeed. the future of continuing-legal-education seminars for the practicing lawyers – the kind that I teach – looks very bright indeed. The parenthetical text between the dashes – “the kind ___ I teach” – was meant to refer to the seminars Garner teaches; after editorial interference, it referred to the lawyers who attend them. The edit was worse than unnecessary. If practicing lawyers were the antecedent (i.e., what the relative pronoun relates back to), that would be grammatically fine, though it goes against NYT style. But it would make more sense in that instance to use whom, since this precludes the possible ambiguity: whom could refer only to the lawyers; that could refer to either the lawyers or the seminars. So a sensible reading would connect that to the seminars. Presumably the two readings were not noticed, just one mistaken one, and the edit was made automatically to accord with house style. If there had been any doubt, the editor would surely have consulted a colleague, or some reference books, or if necessary the author himself. Maybe multiple editors agreed to it. Regardless, the change was made and published and it undermined the sense of the text. If I were editing prose from someone who writes dictionaries of law and English usage, I would expect the prose to be smooth and punctilious, and I would not introduce changes lightly. It’s a minor matter, but not an insignificant one: the “typographic oath” for editors is to do no harm. * I don’t have a copy of the NYT manual, but I trust Merrill Perlman‘s report at the Columbia Journalism Review. A journalist friend on Twitter asked my opinion of ongoing. He said he had been asked to ban it in a style guide, and that he didn’t see why. I said I had nothing against it, and that banning it struck me as excessive and unhelpful. Although I sometimes find constructions like ongoing situation and ongoing issue vague or euphemistic, I see no point in prohibiting them outright. Indeed, there are times when the adjective lends a helpful distinction. Take ongoing treatment in the context of medical care: it immediately conveys the prolonged or recurring nature of the care, as distinct from one-off treatment. You could say continuing treatment instead, but why be obliged to avoid a particular modifier if there’s nothing inherently wrong with it (which there isn’t)? I think there are many occasions when ongoing can profitably be deleted, or perhaps replaced with current, continual, continuing, developing, prolonged, persistent, sustained, in progress, under way, or some such phrase – if only for variation. It is something of a journalistic crutch word, as Oliver described it. But this is no reason to remove it from the realm of possibility. Can we agree to delete the word ‘ongoing’ whenever & wherever we see it? The writing will be improved & the world will be a happier place. A bit harsh, I thought, and checked the Guardian website to see if the word appeared there often. It did: 20,765 times (more by the time you click). Including many headlines. I let @guardianstyle know about this, and they found it “shameful”. Their response was partly tongue-in-cheek, but there’s really no shame in ongoing. A similar search on the Irish Times website yielded 22,187 hits. Even allowing for repeats, these figures strongly indicate that the word is not only well established but also useful. Browsing examples in newspapers and corpora, the usages seem to me to vary from perfectly reasonable to utterly (but harmlessly) superfluous. A Google Ngram charts ongoing’s recent rise to prominence. The trend happened slightly earlier in the U.S. than in the UK (about which see the final quote below). Ernest Gowers, a close observer of the language, called it a vogue word back in the 1950s, and people have been griping about it ever since. Here are a few examples.